Clason, George S. The Richest Man in Babylon - Paperback. Moore, Thomas. Care of the Soul : A Guide for Cultivating Depth and Sacredness in Everyday Life. Dychtwald, Ken; Kadlec, Daniel J. With Purpose: Going from Success to Significance in Work and Life. Florence Scovel Shinn. The Game of Life and How to Play It (Prosperity Classic). From The Purpose Driven Life to Don't Sweat the Small Stuff--And It's All Small Stuff, from	A Book Of Angels to How To Be a Christian Without Being Religious, we can help you find the inspiration books you are looking for. As the world's largest independent marketplace for new, used and rare books, you always get the best in service and value when you buy from Biblio.com, and all of your purchases are backed by our return guarantee. Another Landmark Book by Rick Warren. You are not an accident. Even before the universe was created, God had you in mind, and he planned you for his purposes. These purposes will extend far beyond the few years you will spend on earth. You were made to last forever! Self-help books often suggest that you try to discover the meaning and purpose of your life by looking within yourself, but Rick Warren says that is the wrong place to start. You must begin with God, your Creator, and his reasons for creating you. You were made by God and for God, and until you understand that, life will never make sense. This book will help you understand why you are alive and God's amazing plan for you---both here and now, and for eternity. 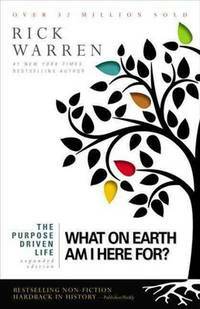 Rick Warren will guide you through a personal 40-day spiritual journey that will transform your answer to life's most important question: What on earth am I here for? Knowing God's purpose for creating you will reduce your stress, focus your energy, simplify your decisions, give meaning to your life, and, most importantly, prepare you for eternity. The Purpose Driven Life is a blueprint for Christian living in the 21st century---a lifestyle based on God's eternal purposes, not cultural values. Using over 1,200 scriptural quotes and references, it challenges the conventional definitions of worship, fellowship, discipleship, ministry, and evangelism. In the tradition of Oswald Chambers, Rick Warren offers distilled wisdom on the essence of what life is all about. This is a book of hope and challenge that you will read and re-read, and it will be a classic treasured by generations to come. The Seven Habits of Highly Effective People, first published in 1989, is a self-help book written by Stephen R. Covey. It has sold over 15 million copies in 38 languages since first publication, which was marked by the release of a 15th anniversary edition in 2004. The book lists seven principles that, if established as habits, are supposed to help a person achieve true interdependent effectiveness. With Who Moved My Cheese? Dr. Spencer Johnson realizes the need for finding the language and tools to deal with change--an issue that makes all of us nervous and uncomfortable. Most people are fearful of change because they don't believe they have any control over how or when it happens to them. Since change happens either to the individual or by the individual, Spencer Johnson shows us that what matters most is the attitude we have about change. When the Y2K panic gripped the corporate realm before the new millenium, most work environments finally recognized the urgent need to get their computers and other business systems up to speed and able to deal with unprecedented change. And businesses realized that this was not enough: they needed to help people get ready, too. Spencer Johnson has created his new book to do just that. The coauthor of the multimillion bestseller The One Minute Manager has written a deceptively simple story with a dramatically important message that can radically alter the way we cope with change. Who Moved My Cheese? allows for common themes to become topics for discussion and individual interpretation. Who Moved My Cheese? takes the fear and anxiety out of managing the future and shows people a simple way to successfully deal with the changing times, providing them with a method for moving ahead with their work and lives safely and effectively. An internationally acclaimed author and philosopher, Marianne Williamson reveals how we each can become a miracle worker by accepting the "God" within us and by the expression of love. Whether our psychic pain is in the area of relationships, career or health, Williamson shows us how love is the potent force, the key to inner peace, and how by practicing love we can make our own lives more fulfilling while creating a more peaceful and loving world for our children. With the same extraordinary skill that he used to demystify scientific abstraction and the new physics, Gary Zukay, the award-winning author of The Dancing Wu Li Masters, here takes us on a brilliant and penetrating exploration of the new phase of evolution we have now entered. With lucidity and elegance, Zukav explains that we are evolving from a species that pursues power based upon the perceptions of the five senses -- external power -- into a species that pursues authentic power -- power that is based upon the perceptions and values of the spirit. He shows how the pursuit of external power has produced our survival-of-the-fittest understanding of evolution, generated conflict between lovers, communities, and superpowers, and brought us to the edge of destruction. Using his scientist's eye and philosopher's heart, Zukav shows how infusing the activities of life with reverence, compassion, and trust makes them come alive with meaning and purpose. He illustrates how the emerging values of the spirit are changing marriages into spiritual partnerships, psychology into spiritual psychology, and transforming our everyday lives. The Seat of the Soul describes the remarkable journey to the spirit that each of us is on. Reprint. Originally published: New York : F.S. Shinn, c1925. Includes bibliographical references. Your Best Life Now: 7 Steps to Living at Your Full Potential is the bestselling book by pastor Joel Osteen. It was published on October 12, 2004 by FaithWords. There is also a calendar, board game, and study guide available based on the book. Introduces a program for self-discovery and divine connection that helps readers determine their higher purpose in life, a process that promotes emotional well-being, healthier relationships, and spiritual rebirth. First published in 1953, the advice that Dale Carnegie gives in this book is basic common sense, but it is combined with case studies, historical examples, and interview with business executives. Cheer up the Blue Day frog and feel better for it. Now available from Bradley Trevor Greive, a soft, cuddly, and exquistely plush frog and delightfully diminutive special edition of the international best-seller The Blue Day Book. Fans the world over will brighten up as they change the expression on the frog's face and enjoy a hilarious, heartwarming classic in a cute new size. Here in one volume are the four collected works of one of America's most beloved and best-selling inspirational authors. In her classic best-seller The Game of Life, Florence Scovel Shinn reveals the timeless message that has helped thousands to solve their problems. You can create anything you want simply by aligning your thoughts and words with the perfect good that resides divinely within you. Combined with the powerful affirmation found in Your Word Is Your Wand and the stirring examples of real-life successes in the other two volumes, The Wisdom of Florence Scovel Shinn provides a complete guide for learning how to turn defeat into victory, lack into prosperity, fear into faith, and resentment into love. Sophy Burnham is an award-winning playwright, novelist, and nonfiction writer. Three of her books have appeared on the New York Times bestseller list. Her works have been translated into twenty-two languages. Her articles and essays have been published in Esquire, New York, The New York Times Magazine, Town & Country, and Reader’s Digest . An international speaker, she has appeared frequently on television and radio programs around the country, including Oprah, Larry King Live, Good Morning America, Today, and CBS Morning News . In addition to her theater interests, she is a seer, a Reiki Master, and a Spiritual Director. She lives in Washington, D.C. From the Hardcover edition. George Samuel Clason was born in Louisiana, Missouri, on November 7th, 1874. He attended the University of Nebraska and served in the United States Army during the Spanish-American War. A successful businessman, he founded the Clason Map Company of Denver, Colorado and published the first road atlas of the United States and Canada. In 1926, he issued the first of a famous series of pamphlets on thrift and financial success, using parables set in ancient Babylon to make each of his points. These were distributed in large quantities by banks and insurance companies and became familiar to millions, the most famous being “The Richest Man in Babylon,” the parable from which the present volume takes its title. These “Babylonian parables” have become a modern inspirational classic. This New York Times bestseller (more than 200,000 hardcover copies sold) provides a path-breaking lifestyle handbook that shows how to add spirituality, depth, and meaning to modern-day life by nurturing the soul. Amy Spencer is a Los Angeles-based relationship expert and journalist, and the author of Meeting Your Half-Orange: An Utterly Upbeat Guide to Using Dating Optimism to Find Your Perfect Match . Visit her website at www.amy-spencer.com.